And this is why his parish perished. Yes a priest surely has a title, many responsibilities, and functions. But he is much more than that. Ordination is more than changing function. It is an ontological change in the priest first and foremost. Something is added at ordination to him that alters who he is at his core. A mystical transformation by the power of the Holy Spirit is given to him. Thus his calling is the one job that is more than a job because it’s not simply a job. Consider the language of St. Paul in his closing thoughts to the early church in Rome. He describes his own ministry when he speaks of how, “the grace that was given me from God, to be a minister of Christ Jesus to the Gentiles, ministering as a priest the gospel of God, that my offering of the Gentiles might become acceptable, sanctified by the Holy Spirit” (Romans 15:15-16). The Greek word for priest is hieros from which we derive the word hierarchy. But the early Apostle-Bishop speaks of his priesthood in terms of offering a living sacrifice of Gentiles to God. The terminology here is more than that of avocation or occupation. It is what we call the nomenclature of vocation and sacrament. First, the priesthood of which St. Paul speaks is a vocation. It is more than an avocation, although the one called into the priesthood should love what he does. Nor is St. Paul’s priesthood strictly speaking an occupation or profession. The modern church has fallen into a great deal of trouble by classifying the minister as a profession. If this priestly service is a profession assuming that all jobs are a profession, then like any of the other professions it has been concluded that there should be equal opportunity for men or women to be at the altar. But what if the priesthood is not a profession? In fact the language of St. Paul’s description of his own priestly service is more than that of a profession. St. Paul uses vocational language. He speaks of special grace given him. And his description implies a special calling. It is true that every Christian has a calling to serve the Lord in the world and in the church. In the world a Christian should have the sense that the Lord has called him or her to be businessperson, lawyer, doctor, truck driver, all noble professions that are to be done as unto the Lord as the New Testament speaks. And in the Church all Christians have spiritual gifts that are to be used. But the priesthood of Holy Orders is a special calling unlike any other. Nowhere is this more apparent than at the installation or the institution of a rector in a parish. 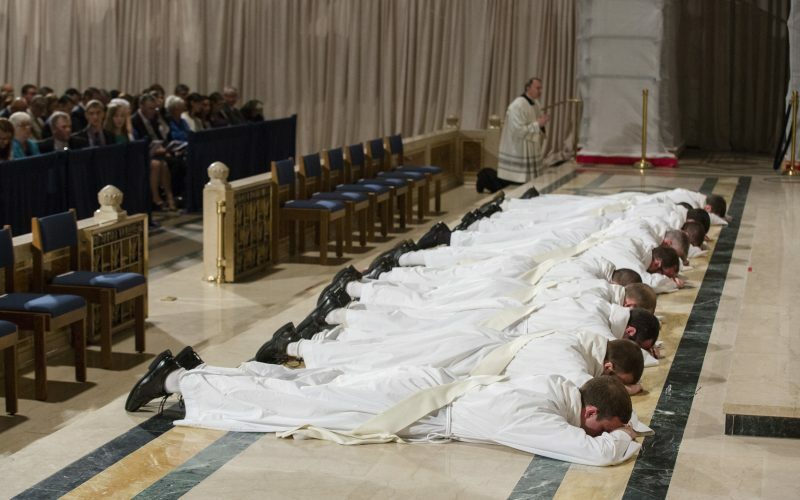 Something happens that I often point out is one of the features distinguishing the priesthood from any other job that indicates it is not a profession. It is a job that is more than a job. When a rector is installed in a parish the bishop of the diocese, either in person or via his representative, installs the rector. Indeed, the minister’s call into Holy Orders began with a discernment process that had to be confirmed by the bishop. No other profession among Christians in the Church has to be approved, confirmed, ordered by the laying on of hands, and yes, actually installed by a bishop. Other noble professions are entered without the laying on of hands of the bishop, or moreover the requirement of the bishop’s institution. Second, when St. Paul describes himself as a priest he uses the language of sacrament. He speaks of how “by the Grace,” the special Grace of God, he is a priest to offer an “offering of or for the Gentiles a sacrifice.” Importantly, this is special grace beyond the grace that saved him. This is the language of sacrament, an outward and visible sign of an inward and spiritual grace. Thus, the order of the minister of the Gospel called presbyter or priest is a sacrament. This is why we view holy orders as one of the seven sacraments. The rubrics of the ancient Anglican prayer books reflect this view of Holy Orders when referring to the institution of the priest by the bishop as establishing a “sacerdotal relation” that the minister might perform “sacerdotal functions” (1928 BCP). The priest unlike any other occupation is therefore a conduit of grace absolving sin, blessing, and in short curing souls. He is actually not primarily to be a philosopher, lawyer, entertainer and so forth. The priest is an icon of Christ, standing in persona Christi, in the person of Christ at the altar. Just as Christ did at the Last Supper, he recapitulates this event by standing in the stead of Christ consecrating bread and wine to become the Body and Blood of the once for all sacrifice of Jesus Christ. The in persona Christi priest re-presents the Son to the Father that the congregation might be atoned to become a living sacrifice of praise and thanksgiving. As such, the priest is a spiritual director guiding his flock to live and proclaim the Gospel. He is to lead his congregation with their consent to a completely consecrated life and offering before the Lord. And this offering is the Gospel to and before the world. govern the ruler You have approved. rule them, and me among them. Amen.